In small bowl, mix mayonnaise and dressing. Spread on one side of each slice of bread. 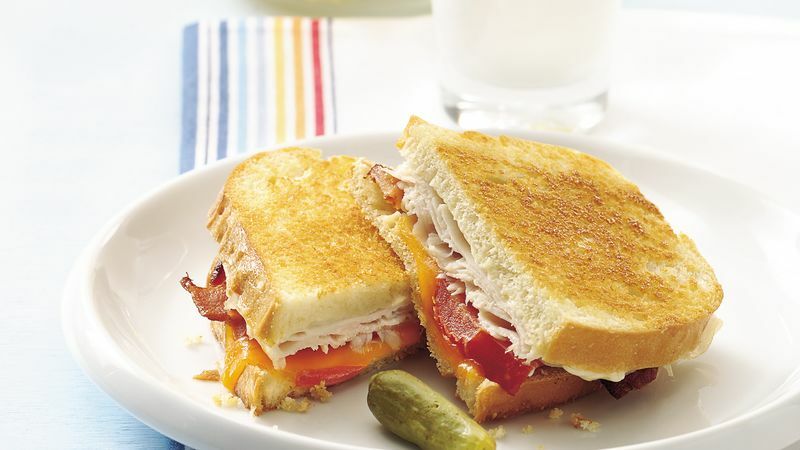 Top each of 4 bread slices with turkey, bacon, tomato, cheese and remaining bread slices, mayonnaise mixture side down. Spread butter on one side of each sandwich. In 12-inch skillet, place sandwiches, butter side down. Spread butter over top of each sandwich. Cover; cook over medium-low heat 6 to 8 minutes or until bottoms are golden brown. Turn sandwiches; cover and cook 5 to 6 minutes longer or until bottoms are golden brown and cheese is melted. These sandwiches are equally delicious with sliced cooked ham or chicken. You can change the type of cheese, too, for a different twist on these grilled sandwiches. Use purchased cooked bacon to make this recipe more convenient.